Chocolate cupcakes are filled with a sweet marshmallow filling, crowned with a rich chocolate ganache and a swirl of marshmallow frosting, and topped off with a chocolate covered pretzel. A campfire in a cupcake! Hi readers! If you know me at all, then you're probably well aware of the fact that I love to bake. You’ve also likely had cookies, brownies, and pies thrust upon you more times than I would care to admit. One thing that always stumps me, though, is when people ask me why I love to bake. The truth is – I’m not sure. I don’t remember when or why it started, ‘sometime in high school’ being my best answer to that question. However it started, my passion for baking has become so much more than a hobby (and, for a year, an occupation). It’s my outlet after a hard day or trying time, when I find peace in the precise measurements and methodical processes. When I can turn on whatever music my soul needs (most often Dixie Chicks or Ella Fitzgerald) and sing my heart out as I sift, whisk, and pour away. When the smell of a loaf of banana bread baking in the oven brings back memories of sitting in my grandma’s kitchen, back when the biggest worry I had was my upcoming spelling test. I woke up on a Friday morning about two months ago and knew I needed to bake something beautiful. Kinda weird? Sure. But there’s a back story. I had been pretty down in the dumps at that point. Why? Because of a boy. Classic, Jesse. I know. I hate it. Hate it hate it hate it hate it. Within one short month I was wooed and romanced… and ghosted on. And then lied to. And then ghosted on again. All by the same guy. And while I’m now very much over the situation (wishing him and his new girlfriend all the best! ), it’s the treatment that really got to me. Why was it okay to lie to me? Why was it okay to ignore me? Why was it okay to treat me like I’m not another living, breathing, feeling human, just like you are? It was, and is, NOT okay. This is one of my favorite quotes from my Yoga Teacher Training, and I come back to it time and again. We’re all people. We deserve to be treated as such. So why did this fuckboy treat me like a toy that can be used and tossed aside? I know it doesn’t mean anything except that he’s very immature. But there was still that inescapable feeling of self-doubt that clouded my judgment for some time. It’s being told by friends that “I deserve better” and not believing them, not thinking I deserve anything at all. It’s being told by other men that I’m a catch, and wanting to believe them, but being unable to think this about myself. Oh yeah? Well, if that’s true, why did he disappear? It was an INCREDIBLY negative, self-perpetuating spiral; one so uncharacteristic of my typically bubbly self. The things I bake make people happy. The things I bake are beautiful. The things I bake are all the things I want to be, and I think that’s why I love it so much. I love to give and I love to make people happy. 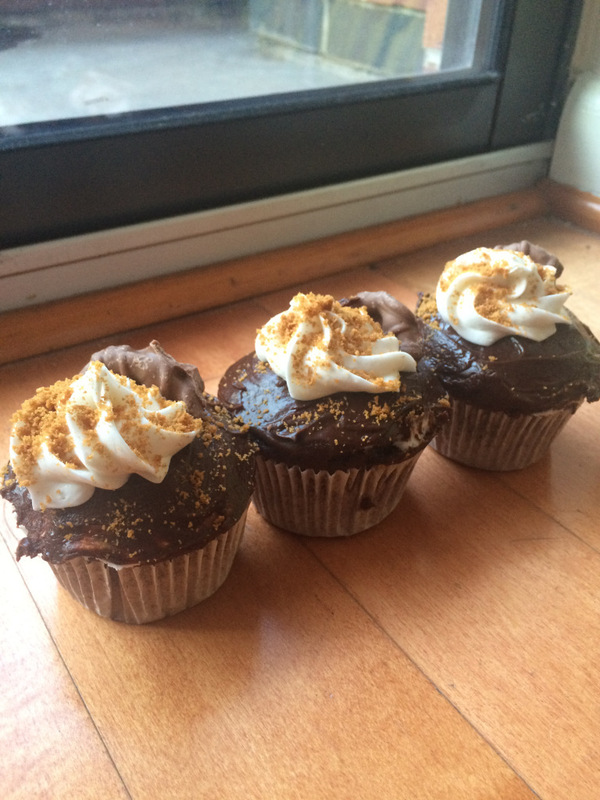 These s’mores cupcake made people happy. And, it took a while, but I'm finally back there again! With more than a little help from my bae Jose Cuervo (and my other loved ones, of course!!!). For this recipe, I wanted to keep the base simple, since there are so many other factors at play. I used a boxed chocolate cake mix, combined with 12 ounces of black raspberry soda to add depth of flavor. Baked at 350F for 17 minutes, and then removed from the cupcake tin to cool. I wanted to fill the cupcakes with a marshmallow crème, but didn’t want to use the standard marshmallow fluff, so I combined 2/3 cup marshmallow fluff, 1/4 cup softened unsalted butter, 1 teaspoon vanilla, 100 grams powdered sugar, and a pinch of salt until it was smooth. I cut a small divot in each cupcake using a sharp knife, and piped the filling in (I simply used a ziploc bag with a hole cut in the corner). I replaced the cake top of each divot and spread on a thin layer of Pillsbury ‘Vanilla Marshmallow’ frosting. I then set the cupcakes in the freezer so that the frosting could harden before I applied the ganache. I combined 2/3 cup chocolate chips with 2 tablespoons heavy cream in a microwave safe(ish… totally burned my hand #oops) bowl and microwaved it for 1 minute. I stirred until all lumps were gone, then added a few tablespoons of powdered sugar and enough warm water to reach a pourable consistency. I let this mixture cool to warm, then spread it on top of the cupcakes’ frosting layer. I used the remaining vanilla marshmallow frosting to pipe a swirl onto each cupcake, and used my food processor to grind a graham cracker into crumbs to top the cupcakes with. 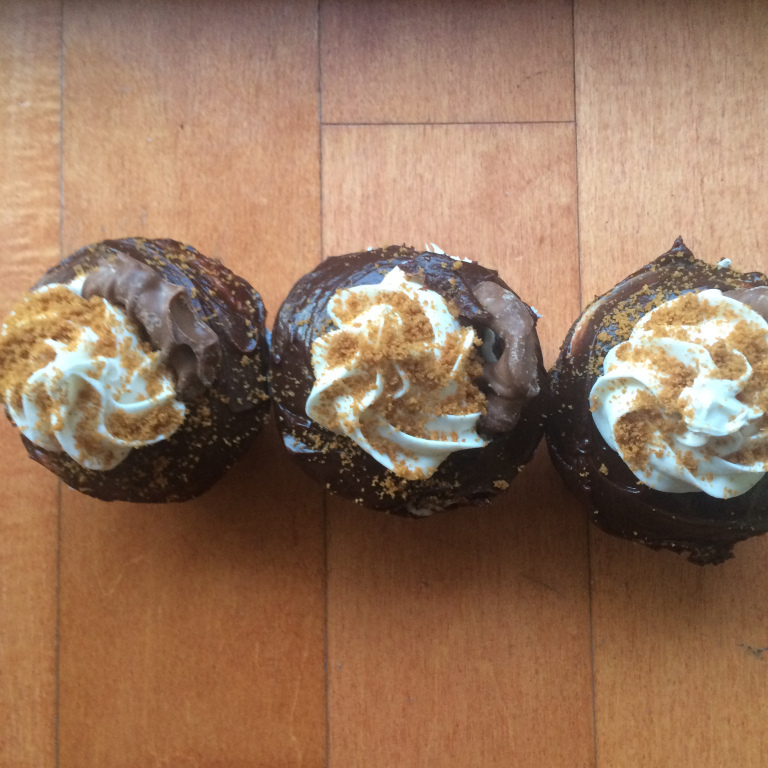 Finally, I split chocolate covered pretzels in half and topped each cupcake with a half. Done and done! These cupcakes are AMAZING and were a huge hit with my friends. They were just what I needed during this trying time. Who knows what my kitchen will put out next?